The sight of figs in the shops always signals the end of summer to me. Which is sad, but not really, because figs are amazing! 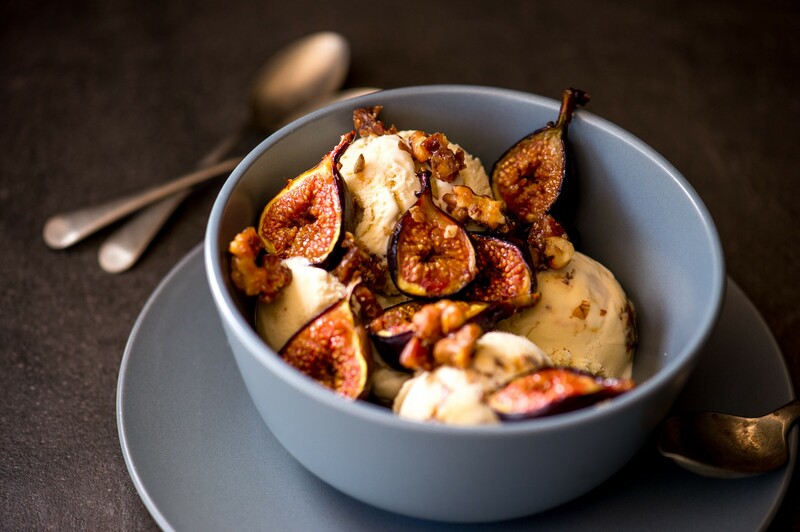 I felt that this Roasted Fig and Walnut Maple Ice Cream would be a perfect dish to cross over from summer into autumn. 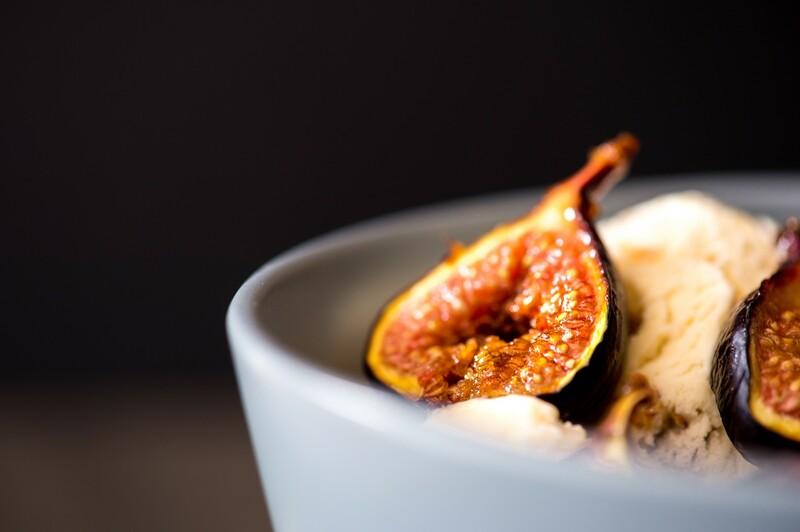 The warm, caramelised figs and toasted walnuts hint at autumn, the cool ice cream refreshing enough for a late summer evening. It’s really worth splurging on a bottle of real maple syrup for the ice cream – the flavour is incomparable! Use what’s left to make some Pecan Pie Granola or drizzle over pancakes. Start by making the candied walnuts. Line a baking sheet with greaseproof paper or a silicon mat. Roughly chop the walnuts. Add the walnuts, butter and brown sugar to a frying pan and heat over medium-high heat. Stir the nuts frequently until the butter and sugar have melted and the nuts are coated and caramelised. This takes about 3-5 minutes. Tip the nuts onto the prepared tray and leave to cool completely. Once cooled, roughly chop the candied walnuts and store in airtight container. Next make the ice cream. Remember to freeze your ice cream maker bowl for a minimum of 24 hours. Place the milk and 125ml of cream into a medium saucepan on low heat. Add the salt. Heat on low heat, stirring occasionally until the mixture just starts to bubble around the edges. Remove from the heat and cool for 1 minute. Whisk the egg yolks and sugar together until pale and creamy, then gradually add in the hot milk mixture, whisking constantly. Return to the saucepan and heat on a low/medium heat, stirring constantly. As soon as the mixture thickens slightly and coats the back of a spoon, remove it from the heat. If you overcook the mixture, it will curdle. Pour the remaining 250ml of cream and the maple syrup into a large bowl, and place a fine sieve over the top. Strain the custard into the cream/ syrup mixture and mix well. Leave to cool to room temperature, stirring occasionally (you can speed this up by placing the bowl into an ice bath). Cover the surface of the ice cream mixture directly with clingfilm and refrigerate for 12 hours or overnight. Churn the mixture in your ice cream maker as per the manufacturer’s instructions. Just before the mixture is done churning, add in the candied walnuts, reserving a few for garnish. Transfer to an airtight container and freeze until ready to serve. When you are ready to serve, prepare the figs. Preheat the oven to 200°C. Slice the figs in half lengthways and place on a lined baking sheet, cut side up. 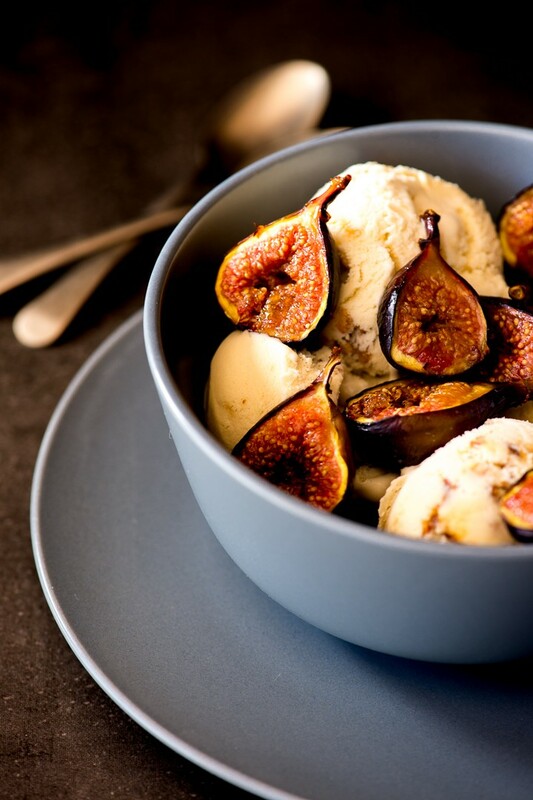 Brush the figs with the melted butter and sprinkle with the sugar. 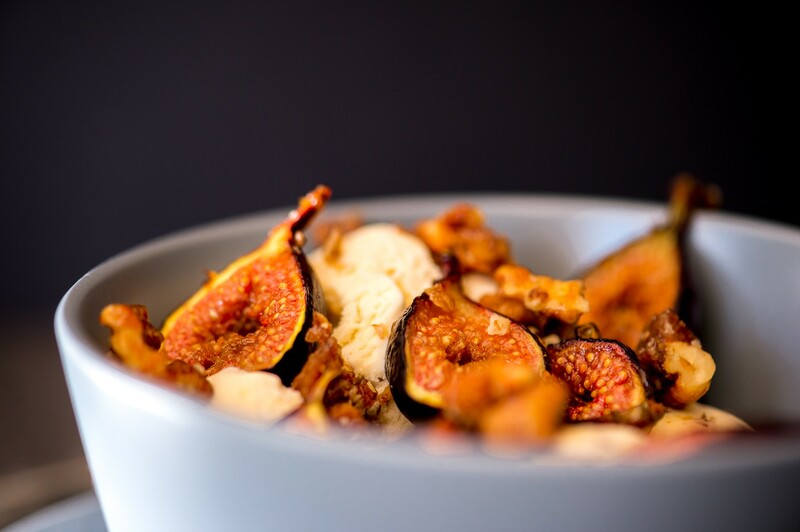 Roast the figs for 10-15 minutes, or until soft but not mushy. Allow to cool slightly, then serve with the ice cream and sprinkle with extra candied walnuts.